It is with great sadness that I write to you today to let you know of the passing of our beloved Trustee John K. Dineen. For close to 30 years, John has been a devoted member of the Board of Trustees, serving as an extraordinary advocate for the mission and students of Cambridge College. No matter what challenges or obstacles the college faced as it grew over the years, John was always there to serve as our guiding light. John was a giant in the field of law throughout the City of Boston, and most recently was Of Counsel at Nutter McClennen & Fish LLP. John specialized in real estate litigation, and was instrumental in providing guidance as we monetized our former home at 1000 Massachusetts Avenue. 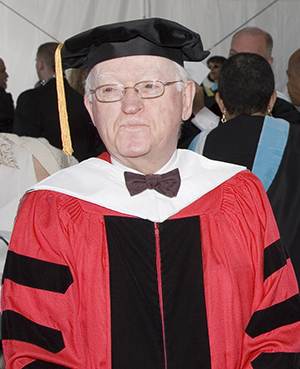 In 2001, the College was honored to present John with an Honorary Degree for all that he had done for the Cambridge College Community. Little did we know how much further his support would go. In 2018, we were thrilled to raise funds in honor of John’s 90th birthday, when we officially unveiled the naming of the John K. Dineen Board Room. John’s advocacy for Cambridge College was shown in many ways. He was not only a generous donor, but frequently ensured that others supported our mission throughout the years. In 2006, John helped to establish The Susan Lowell Wales Dineen Endowed Scholarship Fund in honor of his beloved late wife. In 2010, John spearheaded the creation of another endowed scholarship, this time honoring his longtime friend and fellow Trustee of Cambridge College K. Dun Gifford. Funds from these scholarships have touched the lives of countless students, and continue to ensure that access to an education is not hindered by financial obstacles. John also introduced the College to several private and family foundations over the years, many of which have supported program growth and our annual fund. John will be sorely missed not only by the Cambridge College Community, but by all who had the pleasure of crossing paths with him. From Boston and Nahant to Maine, Florida, and Ireland, John left impressions far and wide.